Google Adsense DO review and accept second appeals! 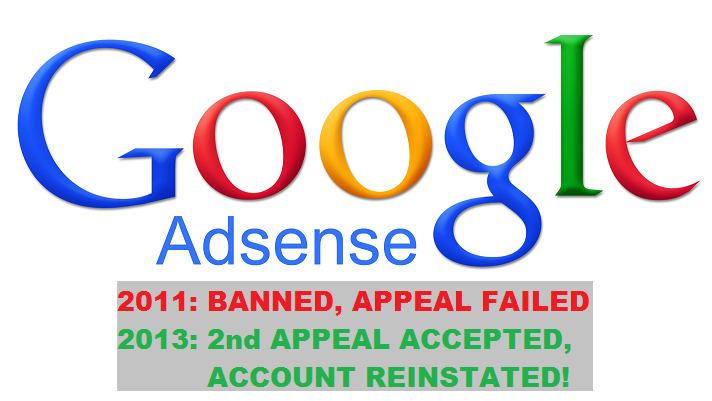 2 years ago, Google Adsense suspended and then disabled my account for invalid clicks (otherwise known as “fraud clicking”), which was both fair and unfair. It was fair because their terms and conditions clearly stated that I should never click on the ads on my own website and even if I wasn’t doing so, I was supposed to track and prevent invalid activities caused by others. And they have to show to the advertisers that it’s unlikely to get cheated by publishers. But I thought it was unfair because I wasn’t given a warning or a second chance. All that I could do then was to send a one-time-only appeal which I rushed into it without taking the trouble to understand the technicalities at all and ultimately getting denied. I had literally given up on Google Adsense and moved on… until some of my videos on YouTube were starting to get quite a bit of views. But I couldn’t monetise them ’cause to do so, I’d have to link it to an active Google Adsense account. So I went as far as trying to register a new account using my business name and fortunately I failed because I then realised that creating a new account was also a violation against their terms and program policies. I was pretty upset and demotivated thinking that it’s almost completely hopeless to make extra income from this blog and my YouTube channels. Let’s face it, there’s no decent alternative to Google Adsense, especially if you’re not from the US or have plenty of traffic contributed by readers from other countries other than your own. All advertisers in any country that has internet and Google will definitely go for Adsense first before even wondering if they should also consider any other channels reach their target audience. Now let’s fast forward to 2 weeks ago when I accidentally found out that Google Adsense now accept second appeals but I believe the condition is that it has be to at least one year since the account was disabled. This time, before filing the appeal, I did an hour of online researching, learning from those who had succeeded in their appeal, and understanding what Google Adsense really what to see on an appeal form submission. I submitted the appeal with little hope that it would even be read but just 4 days later, they replied by thanking me for clarifying my situation and that they have reinstated my account after reviewing my circumstances. I was actually shocked before I started pumping my fists out of joy. 5 days later, my “monetization” on YouTube was reset as well. Lesson well learnt, I’m grateful as hell, and no way I am gonna repeat my mistakes. Click here to go to the appeal form for Invalid Activity and fill up everything. If you are eligible to appeal, you will be given a link to proceed. Mention that you have carefully read and understood the Terms & Conditions and Program Policies. Show that you know which term or policy your account violated and was disabled for. Point out the line or phrase from the Terms & Conditions or Program Policies. Clarify what caused the invalid activities and why. Tell everything in detail but be specific. Don’t go beating around the bushes. Sincerely apologise for your errors if you made any. Many said that Google Adsense do not care about apologies or excuses and only want to see evidences but I doubt this is true ’cause I apologised in my appeal and here I am, an unbanned user! I believe Google Adsense are not merciless. Guarantee that you will adhere all terms of Google Adsense and show them how you will prevent any violation from ever happening. The last part is perhaps the most essential part of the entire appeal form, where they ask you to show backlogs or data of what may have caused the invalid activities. I was fortunate to still have a few days of visitor path logs of that year stored at StatCounter. I copied and pasted the suspicious IP addresses along with the dates, times and URL’s. I’ve even admitted that one of them was me. The point was to show that I now know what’s going on, how it works and that I am now capable of tracking invalid activities by myself. Do not leave any column empty. Answer every question they have on the form otherwise why should they take you seriously? hello, was just wondering where you say that google would read the second appeal form if its been 2 years? its been 2 years since i was banned and would love to try and appeal again, also is there any way to get older traffic logs or stats? i never had any sort of counter or tracker set up but maybe through youtube? thanks! Unfortunately, as for as I know, if you did not set up Google Analytics or any sort of third party tracker earlier, you might not be able to dig up old traffic stats. But you might be able to if you were using Google platforms such as Blogger or Youtube for your Adsense. YouTube's analytics allow you to track views and estimated figures. However, I'm not sure if you would need to set up Analytics for it. Without third party trackers such as Statcounter set up back then, it is perhaps impossible to find the visitor IP addresses as Analytics does not seem to provide such details. sorry for the 2 comments wasnt sure if they went through. any help would be appreciated!